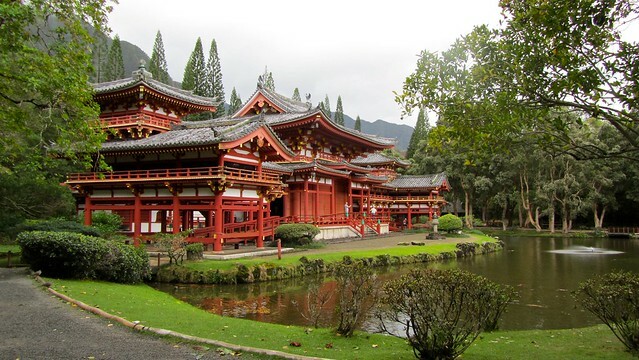 Nestled at the base of the lush Ko'olau mountains in Hawaii sits a nod to the state's Asian heritage — the beautiful Byodo-in Temple. 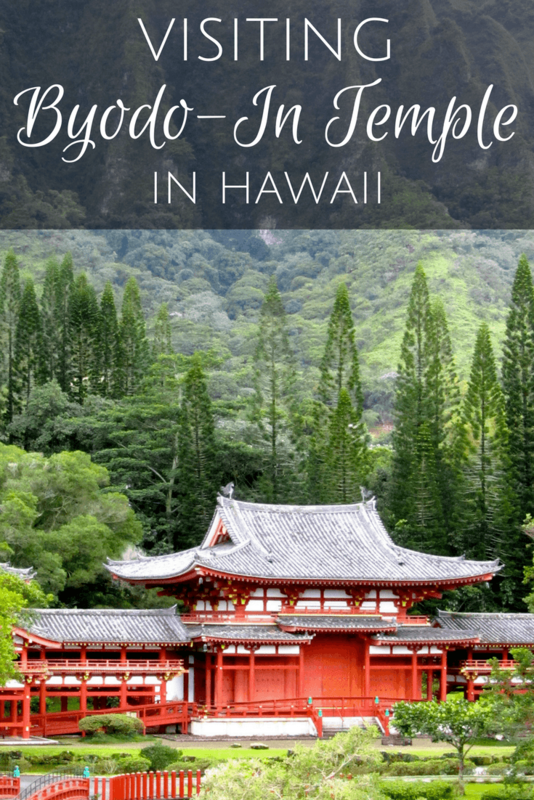 Built in 1968 to commemorate the 100-year anniversary of the first Japanese immigrants to Hawaii, the Byodo-in Temple should be a must-visit for all visitors to the Hawaiian island of Oahu. This nondenominational Buddhist temple, located in the Valley of the Temples Memorial Park, is open to people of all faiths to worship, meditate, or simply visit and appreciate its beautiful surroundings. The temple is a half-scale replica of a 900-year-old structure in Uji, Japan, and is built in the traditional way — without any nails. I visited this scenic spot on an overcast day as part of a . 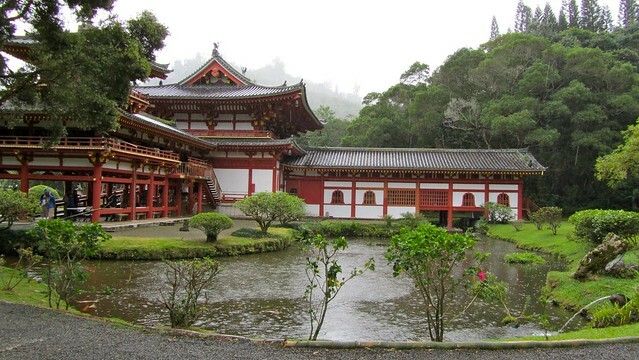 And, while the Byodo-in Temple has turned into a bit of a tourist attraction, I was pleasantly surprised to still find an atmosphere of quiet respect and contemplation. The temple may often be filled with tourists, but it feels anything but touristy. Before entering the temple itself, we were all invited to ring the bon-sho, or sacred bell, that sits in a small bell house to the left of the temple. It is said ringing this 3-ton brass bell just once before entering the temple will purify the mind of evil spirits and temptation before meditation. It's also supposed to bring the ringer happiness, blessings, and a long life. After ringing the bell, it was on to the temple itself. The building is beautiful and intricate, with the vibrant red and yellow and crisp white colors contrasting with the lush green surroundings. It was quiet, with birds chirping and a few fat raindrops plopping into the surrounding reflecting pools. 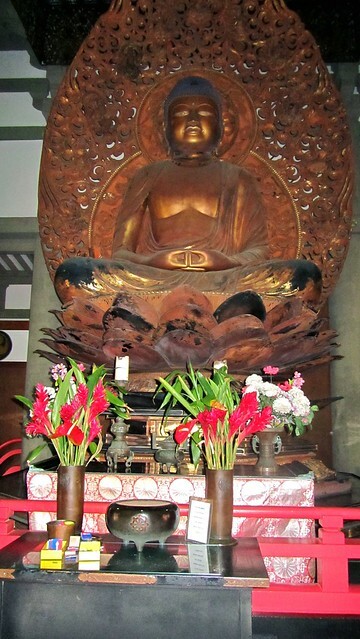 All visitors of all faiths are welcome to enter the main room of the temple where a 9-foot-tall Lotus Buddha statue sits — you're just asked to remove your shoes as a sign of respect. Once back outside, you might notice that the temple's reflecting pools are filled with hundreds of colorful koi. If you want to see them in action (meaning squirming all over each other in one huge fishy mass), you can purchase some fish food from the nearby tea house gift shop. It started pouring just as we got to the far side of the temple. And, while it left most of us rather soggy and a bit chilly for the next half hour or so, the temple itself still managed to look peaceful and impressive. 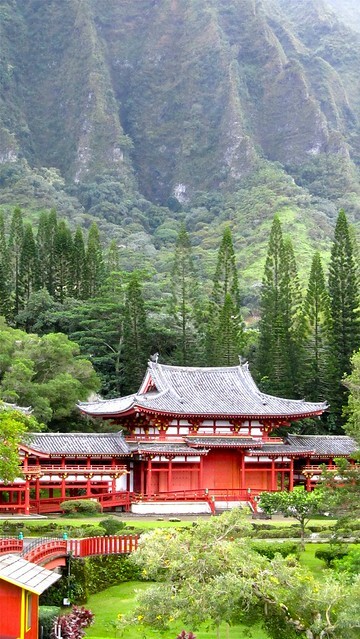 If you ever find yourself with some free time on Oahu, I highly recommend visiting the Byodo-in Temple. 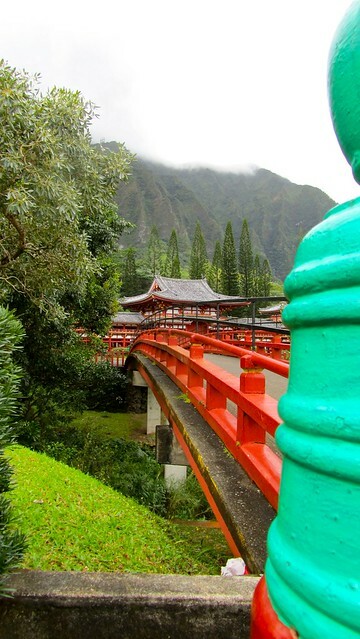 WHERE: The Byodo-In Temple is located in the Valley of the Temples, on the eastern side of the island of Oahu in Hawaii. A visit is usually included in most . WHEN: The temple grounds are open from 8:30 a.m. to 5:00 p.m. daily. HOW MUCH: Admission to the temple is $5 per adult. Would you ever expect to find something like this in Hawaii? I know I sure didn't! It really is so beautiful, though! For a while, I totally forgot I was in Hawaii! Wow, it’s stunning!!! I bet that place had some intense energy. Did you have it all to yourself? I was in a small tour group, so I didn’t have it all to myself. But it was still amazing and beautiful and peaceful. The photo of the temple with the mountain looming behind it is beautiful. This looks like a good place to relax and reflect – very peaceful! Thanks, Christy! I think that may be my favorite photo in this bunch… though, it’s tough to pick! And yes, this would be a great place to relax. There are even a few meditation pavilions that are set a bit away from the temple for further privacy. I know! I know Hawaii has been pretty strongly influenced by Asian culture, but I still wasn’t really expecting to find such a gorgeous temple out in the countryside. That is a gorgeous temple! And the surrounding landscape is beautiful! Thanks for sharing, I’ll have to make sure I visit if I ever get to Oahu! Thanks, Connie! This temple is probably in one of the most stunning spots on the island, right at the base of those amazing mountains. Definitely worth a visit! It’s actually based off a Japanese temple located in Uji, Japan. But many Chinese temples use some of the same colors and similar construction. I miss that beautiful red/orange they use to paint railings and shrines. It’s a really striking color. Great to take photos of! Thanks, Amy! And there’s much, much more to see in Hawaii that makes it worth a visit – even in the rain! I wasn’t aware that Hawaii had japanese immigrants, and it’s interesting knowing such a great replica exists over there since i’m a huge fan of Japanese culture and all things japanese. 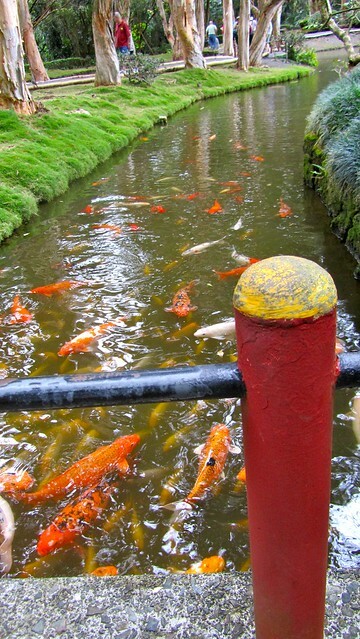 And i’ve never seen so many koi in one place, thank you for the beautiful pictures and the short history lesson. Oh yes, Hawaii has a high number of immigrants from a lot of Asian countries, as well as other Polynesian and island nations. 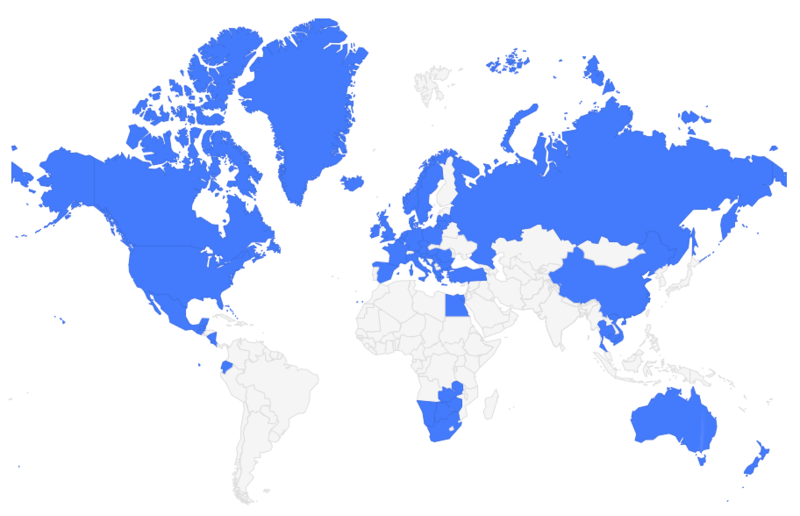 I think it probably has something to do with its location right smack dab in the middle of the Pacific. I’m glad you enjoyed the photos, and the mini history lesson! Those are beautiful scenery of Japan! I am also coming from Asia, and I really like Japanese’s scenery, food, and people. Some of my friends are actually Japanese, but I have never been there. I know one Hawaiian who is married to Japanese lady, for me, going to Japan and Hawaii one day is a dream.. So glad you enjoyed the post! And I hope you get the chance to visit both Japan and Hawaii someday! I can’t wait to visit in March! This was number 1 on my to-see list! Great post! Enjoy! It’s a cool spot!